I’m getting back into the Belgofoot business after a bit of a break. The international team are meeting up again for their European qualification games and I managed to take in the Belgian Cup Final last weekend in Brussels. Following that come the infamous Belgian Playoffs. First up was the Cup Final. It was a match of high-risk as some of the fans of Anderlecht and Club Brugge are not on particularly good terms. The police were out in their thousands and there was indeed trouble in the centre of Brussels. That was caused primarily by fans of ADO Den Haag who felt that they had sufficient affinity with Club Brugge supporters to warrant travelling to Brussels where they clashed with the fans of Anderlecht. There were about 30 arrests and quite a lot of collateral damage. This didn’t get a lot of media attention, certainly not compared to the incident of Standard Liege banner a few weeks ago. The game itself was a good one – with two goals in the last couple of minutes – and the Cup going to Michel Preud’homme’s Club Brugge. He’s a coach who has a habit of bringing success to clubs who have not won trophies for many years. The Belgium team next play Cyprus in Brussels and then fly to Tel-Aviv to take on Israel, who these days play in the European championships. One of the main talking points these days is whether Eden Hazard and Kevin De Bruyne can play together? They are becoming Belgium’s answer to Steven Gerrard and Frank Lampard – in days of yore. De Bruyne has been the main playmaker for Belgium in recent games and he has been on tremendous form for Wolfsburg, creating more goals than anyone else in Europe. 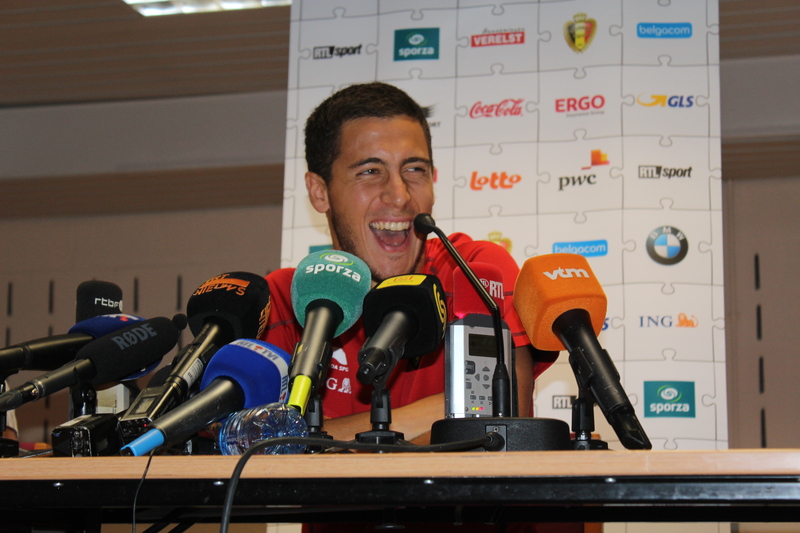 Eden Hazard is of course … Eden Hazard. When Belgium played Wales, Hazard wanted to get more into the game – as he has rarely sparkled for Belgium – and he more or less forced De Bruyne out to the centre. The media picked this up and created a story about whether the two were compatible. Marc Wilmots then stated he would move De Bruyne out to the wing, later saying he had said that to keep the media quiet. We will see what Wilmots does. Geert De Vlieger – an ex international turned pundit – made the most sane remark, saying good players will learn how to play together. Yesterday I was invited onto the Cheeky Backheel Show – a podcast based in, I think, Tel-Aviv. I was asked to talk about the Belgium team ahead of the match with Israel next week. It was a enjoyable 20 minutes, hosted by the Sports Rabbi, Josh Halickman. You can hear my ramblings here. One of the things that’s good about following Belgian football is that you discover that the footballers and ex-footballers you meet are extremely friendly. (Ed: I think he will be name-dropping here.) I had the chance at the Cup Final to meet up with Philippe Albert – who I interviewed a few years ago. At that time, I remember his wife saying they wished they had stayed in the UK for longer as they loved it there. I also had a brief chat with Marc Degryse, who had a spell with Sheffield Wednesday,and he was up for an interview for the blog later in the year. I also spoke to ex Anderlecht midfielder Walter Baseggio, now recovered from thyroid cancer and looking well. He was on good form and looking forward to the Cup Final, which did not disappoint. All three are now media pundits as their careers were too early to allow them to put a few millions in the bank. Times have changed.